The blacksmith's forge has remained similar in design and purpose for millenniums. Some of the differences being in the materials we now use to build our forges and the source of air supply and delivery. Despite its modern look, the modern forge works exactly the same as those of its predecessors. Firepot or hearth -- a place where the burning fuel can be contained over or against the tuyere opening. 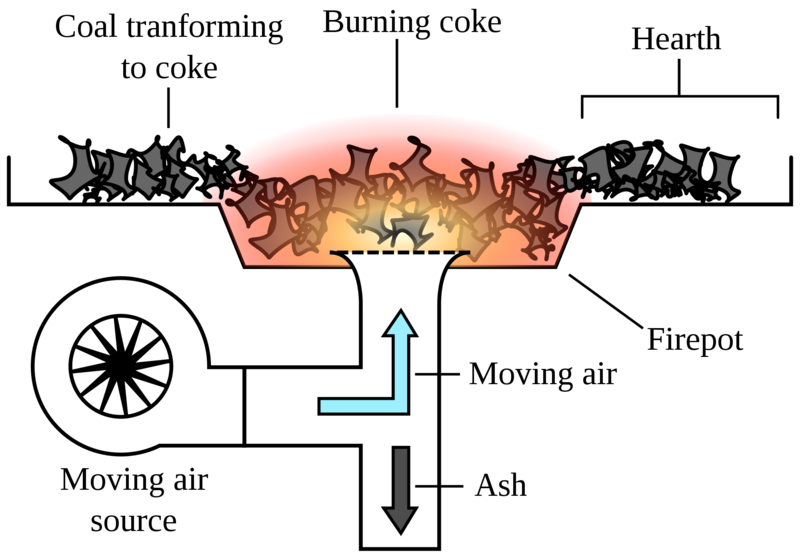 In a typical, but by no means universal, coal forge, a firepot will be centered in a flat hearth. The tuyere will enter the firepot at the bottom. In operation, the hot core of the fire will be a ball of burning coke in and above the firepot. The heart of the fire will be surrounded by a layer of hot but not burning coke. Around the unburnt coke will be a transitional layer of coal being transformed into coke by the heat of the fire. Surrounding all is a ring or horseshoe-shaped layer of raw coal, usually kept damp and tightly packed to maintain the shape of the fire's heart and to keep the coal from burning directly so that it "cooks" into coke first.